The Oracle Cost Based Optimizer, the MS-SQL Server optimizer and the PostgreSQL query planner cannot use a NESTED LOOP physical operation to execute FULL OUTER and RIGHT OUTER joins logical operations. They all address the RIGHT OUTER join limitation by switching the inner and the outer row source so that a LEFT OUTER JOIN can be used. While the first two optimizer turn the FULL OUTER join into a LEFT OUTER join concatenated with an ANTI-join, PostgreSQL query planner will always use a HASH/MERGE JOIN to do a FULL OUTER join. As you can see, in accordance with the algorithm, for each row in T1 table (A-Rows=3 operation id n°2) we scanned 3 times (Starts = 3 operation id n°3) the T2_IDX index. So far so good. A HASH JOIN FULL OUTER to honor a full outer join between two tables. But what if I want to use a NESTED LOOP FULL OUTER instead of HASH JOIN FULL OUTER join ? What the heck is this execution plan of 8 operations? Instead of having a simple NESTED LOOP FULL OUTER I got a concatenation of NESTED LOOPS OUTER and a NESTED LOOPS ANTI join.That’s an interesting transformation operated by the CBO. Do you know why Oracle did all this somehow complicated gymnastic? It did it because I asked it to do an impossible operation: NESTED LOOP doesn’t support FULL OUTER join. Don’t be confused here. The above RIGHT OUTER JOIN has been turned into a LEFT OUTER JOIN by switching the inner and the outer table. As such, T2 being placed in the left side of the join Oracle is able to use a NESTED LOOP to operate a LEFT OUTER JOIN. 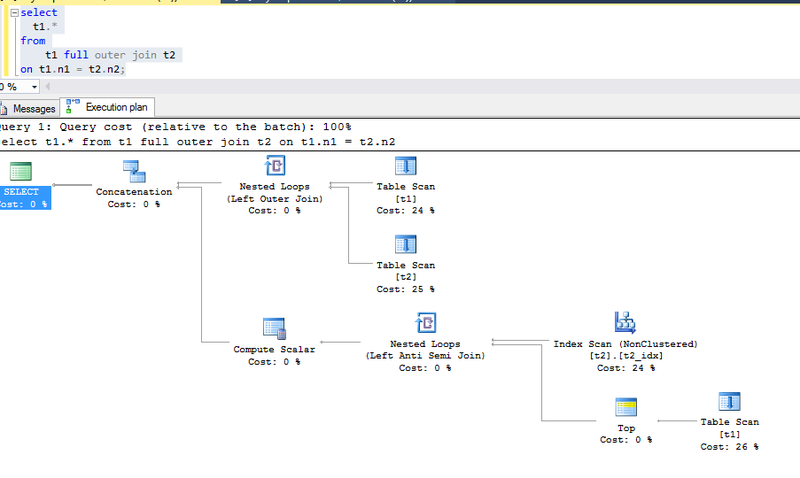 You will see this clearly explained in the corresponding SQL Server execution plan I will show later in this article. Spot in passing how disabling the hash join option (set enable_hashjoin=false) is not an irreversible action. Whenever the query planner is unable to find another way to accomplish its work it will use all option available even those being explicitely disabled. In several if not all modern Relational DataBase Management Systems, NESTED LOOP operation doesn’t support right outer and full outer join. Oracle, MS-SQL Server and PostgreSQL turn “T1 right outer join T2” into “T2 left outer join T1” by switching the inner and the outer row source. Oracle and SQL Server turn a full outer join between T1 and T2 into a T1 left outer join T2 union-all T2 anti-join T1. PostgreSQL will always use a hash/merge to full outer join T1 and T2. Forget the switch from a FULL TABLE scan to an INDEX FULL scan at line n° 3 and the switch from a SORT to a NOSORT operation at line n°2. What other remarkable difference we can still spot out there? Have you noticed that operation n°3 produced 1000 rows in the first execution plan and only 6 rows in the second one? What happened here so that an operation without a filter predicate produces 6 rows where it is supposed to generate the entire set of rows in the table i.e. 1,000 rows? The explanation comes from the way Oracle handles blocking and non-blocking operations. A blocking operation requires receiving all rows from its child operation before a single row can be processed. A non-blocking operation consumes and produces rows at the same time. Applied to the current situation, we see that the two previous execution plans have both a blocking operation at line n°2 which is the VIEW operation. In fact, as magnificiently explained by Jonathan Lewis in this post, the blocking nature of the VIEW operation is function of its first child operation. If this one is a blocking operation then the VIEW is a blocking operation as well. If, however, the child operation is not blocking then its VIEW parent operation is a non-blocking operation that can consume and produce rows at the same time. The WINDOW SORT PUSHED RANK child operation of the VIEW is a sort operation. Sorts,as you know, are blocking operations. This is why the VIEW in the first execution plan is a blocking operation. Oracle has to retrieve all rows from table t1 (A-Rows = 1000) at operation n°3, sort them totally at operation n°2 before applying the filter predicate n°2 reducing as such the number of retrieved rows to only 5. In the second execution plan the WINDOW NOSORT STOPKEY child operation of the VIEW is a non-blocking operation thanks to the ordered list of keys it receives from its INDEX FULL SCAN child operation. The VIEW asks for the first row from its first child operation which, at its turn, asks for the same row from its child operation the INDEX FULL SCAN at line 3. The index gives the first ordered key it has found to its parent operation, the WINDOW NOSORT STOPKEY,which feeds back again it parent operation, the VIEW, provided the index key survives the filter predicate n°2. The VIEW asks then for the second row, for the third row, and so on until the WINDOW NOSORT STOPKEYdeclares the end of the query. Indeed, the WINDOW NOSORT STOPKEY knows the upper bound it can’t go beyound. This is why when it receives the 6th row from the index full scan operation (A-Rows= 6) it realises that this row spans its upper bound and that it is now time to signal to the coordinator (select statement) the end of the query. Sometimes we need to read and interpret execution plans not only in their order of operation using the “first child first, recursive descent” rule, but also in their order of data flow propagation (or row-source generation). In the latter case, knowing how to identify blocking and non-blocking operations is very important. I have been reminded by this otn thread that I have to write something about the usefulness of an execution plan pulled from memory of a query that has been cancelled due to its long running execution time. Several months ago I have been confronted to the same issue where one of my queries was desperately running sufficiently slow so that I couldn’t resist the temptation to cancel it. It is of course legitimate to ask in such a situation about the validity of the corresponding execution plan? Should we wait until the query has finished before starting investigating where things went wrong? What if the query takes more than 20 minutes to complete? Will we wait 20 minutes each time before getting an exploitable execution plan? The answer of course is no. You shouldn’t wait until the end of the query. 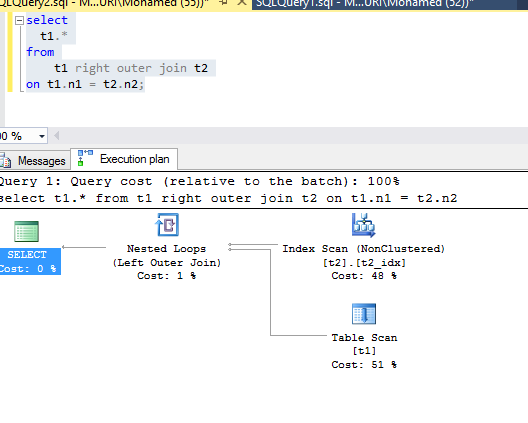 Once the query has started you could get its execution plan from memory using its sql_id. And you will be surprised that you might already be able to found a clue of what is wrong with your query even in this ‘’partial’’ execution plan. Let me model an example and show you what I am meaning. The above query contains an order by clause on an indexed column (id). In order to make this query running sufficiently slow so that I can cancel it I will change the optimizer mode from all_rows to first_rows so that the CBO will prefer doing an index full scan and avoid the order by operation whatever the cost of the index full scan operation is. The query took more than 2 minutes to complete and for the purpose of this blog I didn’t cancelled it in order to get its final execution plan shown above. Now I am going to re-execute it again and cancel it after few seconds. So there is nothing that impeaches hurried developers from cancelling a query and getting its execution plan from memory. They can end up with valuable information from the cancelled query plan as well as from the complete plan. This article is also a reminder for experienced Oracle DBA performance specialists that, there are cases where a difference between estimations done by the CBO and the actual rows obtained during execution time, does not necessary imply an absence of fresh and representative statistics. This difference could be due to a plan coming from a cancelled query. By the way, I know another situation where an excellent optimal plan is showing a value of Starts*E-Rows diverging greatly from A-Rows and where statistics are perfect. That will be explained, I hope, in a different blog article. It is well known that display_awr function is unable to show the predicate part of a captured execution plan. Is this still the case with the 12c advent? The predicate part is still not shown in the execution plan taken from AWR. Damn!! Very recently, two interesting blog articles, here and here, have been published to emphasize the possibility of having a same plan hash value for actually two different execution plans. In this context of plan hash value inspection, Carlos sierra from the Oracle support published a blog article showing that his sqltxplain tool has the ability to consider execution plan using not only the plan hash value but two additional pieces of information which are SQLT Plan Hash Value1 and SQLT Plan Hash Value2. The last information is related to the predicate part which is here the central point of difference between “my” two execution plans. Well, why not try sqltxtract for this case using sql_id ba39fv7txcsbk (click on the picture to enlarge it)? Spot how the sqltxtract module shows the presence of two execution plans having the same plan hash value (2339135578) but different plan hash value2(62199 and 22135). This plan hash value2 concerns a difference into the access and/or the filter predicates. Meaning that this sql_id has not got a difference in the predicate part of its execution plan. Well, from where am I going to start here? Hmmm… always the same question when trying to interpret an execution plan. That’s seems a little bit strange. Why not a direct HASH JOIN OUTER between the YAS view and the MHO table instead of a JOIN between the YAS view and that NESTED LOOPS (where an access to MHO table is made)? Have you already pointed out how the predicate part can make you asking good questions? As I wanted it to be: directly between the MHO table and the YAS view. Clearly this is a waste of time and resource. It is better to have a more precise index or to not use that XXX_RIP_CREATION_DATE_I index at all. But how can I (see this is another question again) make the CBO generating the HASH JOIN OUTER I want without forcing the use of that function based index? The view YAS is not selected from. It should be taken out from the join and put into the where clause as an EXISTS condition. Doing so, the ABC table will not be considered by the CBO as the driving table because it is the table that is outer joined (is this correct? I have to admit that I need to test it deeply in order to be sure enough about that fact). As such, the CBO will directly join the MHO table with the YAS view first (this is what I want in fact) and then outer join the result to the third table. The query is now responding better than before the change request. Doing a full table scan on MHO table in this case is better than to access it via the existing non precise function based index and then filter the returned rows(by rowid) to through 97% of them. which is returning 39 records in a very acceptable response time. However, when he adds a simple order by to that query, the response time become very nasty and not acceptable at all. When I asked about the value of the optimizer mode he is using, I was not really surprised when he answered “I am running under FIRST_ROWS mode”. The aim of this blog is exactly to explain the nasty side effect the FIRST_ROWS optimizer can produce particularly in presence of an order by clause. Woo!!! Note the apparition of the costly operation 3 INDEX FULL SCAN, the enormous cost difference between all_rows and first_rows and the absence of the order by operation. Under the later mode, Oracle optimizer prefers using a costly INDEX FULL SCAN operation instead of doing a sort operation which in this case will generate a catastrophic response time. In order to tune a query you need first to get its real execution plan that describes the operations dictated by the Oracle optimizer and followed by the SQL engine to execute this query. It can’t be enough emphasized that getting the exact explain plan (and not the expected one) represents an important step when troubleshooting query performance problems. This document aims to describe in detail how to obtain the real explain plan followed by the SQL engine. Unfortunately there exist situations where the ‘explain plan for’ command may not report the real explain plan followed by the Oracle Optimizer to execute the query. This situation occurs particularly when using bind variables. You should know that the ‘explain plan for’ command treats all bind variables as of a VARCHAR2 data type; this is why an implicit data type conversion might happen during the ‘explain plan for’ command while there is no implicit data type conversion when the query is executed. And that’s where the limit of the ‘explain plan for’ command comes from. Remember that the id column has been declared as varchar2 and that we issued our ‘explain plan for’ command using a bind variable declared as number (var x number). As far as the ‘explain plan for’ command treats all bind variables as VARCHAR2 it has reported that the index has been used; which is, unfortunately, completely false. And that is the topic of the next paragraph. Notice how the dbms_xplan.display_cursor() function has correctly reported a TABLE ACCESS FULL instead of the INDEX RANGE SCAN path (initially reported by the ‘explain plan for’ command) due to the TO_NUMBER (see the predicate information) conversion that occurred during the query execution. It is well known that the Optimizer will do a good job only if E-Rows and A-Rows have close values. When, instead, these two cardinalities present two largely different values, then this is a clear indication of inefficient execution plan probably due to stale statistics on related tables and indexes. However, be aware that, before jumping to conclusions, you need always to compare E-Rows with round (A-Rows/Starts). And if you don’t supply the sql_id or the child_number to the dbms_xplan.display_cursor() function, it will reports the last executed SQL statement.